Many variations of electronic music have touched on the fragile borders between man and machine. No artists have explored this idea more thoroughly than those working in electro, a genre that injects the fluid energy and vibrant dynamism of funk music into instruments known for their steely resolve and rigidity. Uniting two seemingly opposite forces in an electrifying synergy, electro proved that dance music can capture the passion, spirit and elasticity of live performance, rebuking those early critics who characterised electronic music as soulless repetition, mechanically played by gridlocked and unfeeling machines. Artists as diverse as Warp 9, Hashim, and Arthur Baker brought together elements of funk, boogie, hip-hop, and disco, along with far-flung inspirations from Kraftwerk and Yellow Magic Orchestra, to forge a unique sound that’s since been refracted into a thousand different variations, surviving decades to find itself as vital and relevant as ever. One of the most influential groups to come out of the electro movement, Aux 88 pioneered a techno-adjacent take on the genre alongside similarly exalted production outfits Drexciya, Cybotron and Model 500. Though their most widely recognised releases – including the seminal 1996 LP Is It Man or Machine? - were issued under their own name, the members of Aux 88 have worked under a variety of aliases, carving out a reputation as one of the most formidable live acts in electronic music over a career that spans almost thirty years. We caught up with Keith Tucker and Tommy Hamilton last week after they brought the Aux 88 live experience to London’s E1 alongside Helena Hauff and DJ Stingray, speaking about formative influences, the current state of electro, and their views on the symbiotic relationship between musicians and their tools. You played last weekend at Helena Hauff’s electro-centric Return To Disorder party, at your first London show in over five years – were you glad to be back? London was truly amazing, as we arrived directly from a one-hour sleep after playing a day earlier at the mighty Tresor club in Berlin. We were tired, and had some issues finding our driver in Heathrow airport, by the time we found him after two hours in customs it was time to go directly to sound-check and dinner, before we even arrived at our hotel. We weren’t mad, just tired… but we had a great sound check with the guys at the club, they were very nice and really made us sound astounding at the show. We don’t take the sound team for granted, they do a great job and we appreciate them - it’s always cool to arrive and they remember us from previous shows and tell us we were very easy to work with. So, as to your question: hell yes, we were glad to be back. Why so long? We play everywhere… Tommy and I discussed putting together an AUX88 party in a club in Europe - after the turn out we had, wouldn’t that be nice? "Hell yes, we were glad to be back." Tell us about your earliest memories involving music. Who do you consider your most formative influences as producers and performers? Our earliest memories were listening to radio in Detroit. We heard it all every day, from Motown, ‘70s Funk, Disco to early Euro in the ‘80s. Me and Tommy were highly influenced by the funk and Euro-dance of the ‘80s - Parliament Funkadelic were prominent in our early listening, along with The B52s, Kraftwerk and our Detroit hero Cybotron. As for our biggest influences as performers, it’s no secret that we’re influenced by Kraftwerk, and to some extent hip-hop, as we work the crowd in our shows. As producers we loved the conceptual elements of early Detroit techno - the artists worked so hard to create with only the synths they had. You’ve released under a range of aliases over the years – RX-7, Sight Beyond Sight, Black Tokyo, Mad Scientist – are these based on different approaches to production and are there distinct variations between these guises? Aux88 is electronic electro-funk, Optic Nerve is Detroit techno. Posatronic is minimal funk for the urban dance-floor, and Alien FM is electronic music transmitted from alien radio. As for Aux88 Presents Black Tokyo… Tom Tom created the beautiful concept of merging Detroit with music culture and sound from Japan, accompanied by two beautiful Japanese divas Erika and Ice Truck. This is one of our favourite products, as we were performing the songs on tour about four years before the music was officially released. Aux88 Presents Mad Scientist was our salute and love to our Brother James Stinson, with Aux88 steampunk electro from the future. We were trapped in our studio with every drop of hardware to put together some of the funkiest music we have ever made. On tour that included dark visuals and screeching electronic vocals, put together in our own Aux88 way. It was an LP dedicated to James Stinson, and not many people knew that. We have so many more aliases and we still don’t think many people know all of them. "Aux 88 is electronic electro-funk, Optic Nerve is Detroit techno. Posatronic is minimal funk for the urban dance-floor, and Alien FM is electronic music transmitted from alien radio." Your latest release came in 2014 with ‘Music Is Your Medicine’. Are you both still regularly writing and recording music? Do you have any further releases planned for 2019? Yes. We had been touring so much that we didn’t have time to make any new music, but something good came out of that. We were all building four new studios in 2018, Tom Tom, K-1, Blak Tony and Posatronix, who were band members in the original Aux88 line-up and live show. We were going through a serious transition, with getting all the music we had ever made from the label Direct Beat, and in 2017 we received all our music from every entity we had ever made back. Yes, that inspired us even more to create new music, which is coming out in August 2019: Aux88’s COUNTERPARTS LP, with all four members and a tour to follow. We created DB Classics in 2018 to re-release all our Direct Beat and 430 West Records releases, and we released three classics the first year with resounding success and many repressings. Ironically we are stocking the new repressings as we speak, for release in just a few weeks, so get ready for more classics, new music, and rare Aux88 releases and merchandise. Distributors from all over the world really have supported the classics and are waiting for more. "That inspired us even more to create new music, which is coming out in August 2019: Aux 88’s COUNTERPARTS LP, with all four members and a tour to follow." What’s the latest news from Puzzlebox Records – is the label still a focus for you, or have you moved towards other projects? Keith Tucker: So glad you asked. I have restarted my label back up but with a different approach, releasing classic repressings first and then some new music, techno and electro. First repressing coming in two weeks - PUZZLEBOX RECORDS IS BACK! 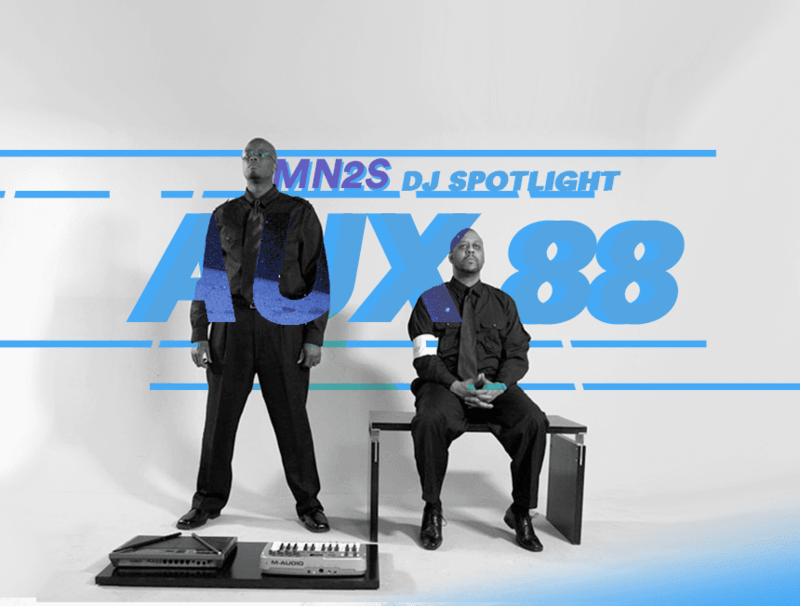 Though you’re both accomplished DJs, the name Aux 88 is synonymous with live electronic performance. How does your approach differ when taking on a DJ set as opposed to a live Aux 88 performance? Keith Tucker: I’m truly the only guy that is "a DJ" from Aux88, but Tommy is a good DJ and has played before. When I play DJ sets, I’m DJ K-1. Aux88 is only for live shows with K-1 and Tom Tom, and with Posatronix and Blak Tony on bigger shows. Aux 88 live is not a group you want to follow up, we love to play live. You never know what we might play, as our set consists of techno, electro and sometimes cover tunes to give thanks to groups that inspired us. We have played covers of Kraftwerk tracks like ‘Man Machine’, ‘It’s More Fun To Compute’, Cybotron’s ‘Clear’, ‘Technicolor’, Model 500, No UFO’s ‘YMO Firecracker’, Hashim’s ‘Aly Nafish’, to Larry Heard’s ‘Can You Feel It’. Not many know that we were the first backing band for Juan Atkins Model 500, and performed at the first Model 500 / Cybotron show at the Metroplex 10-year anniversary. The band members were Juan Atkins, Mike Banks, Tommy Hamilton (Tom Tom) and Keith Tucker (K-1) - how many people know that AUX88 programmed the whole show, synths and drums? "Aux 88 live is not a group you want to follow up." Though there’s been continued talk of an ‘electro revival’ for a couple years now, many would argue that the genre has been a constant presence over the past three decades, never fading from view. Where do you stand on the issue – is this ‘revival’ just music media hype, or has there been a genuine resurgence? It never left - we have never stopped touring! I think the genre is now starting to be accepted by more die-hard genre fans who liked other styles of electronic music, thanks to artists making timeless productions like Gerald Donald, Aux 88, Anthony Rother, Ed Upton, Clone Records Crew, DIE, just to name a few. The secret to electro is one thing: the ladies love it, they like to dance to it. The real electro has grown and gotten so much better, and there are still a few great artists making good electronic funk - because that is what true electro is - with artists like DJ Stingray playing it all in his great intricate DJ sets, it is reaching a new level and people are still just discovering some of our early music. It’s a great feeling to hear so many of our songs at clubs that we completely forgot about. Another issue of contention is the divide between devotees of hardware and software-based performance and production. Do you feel that there is an equal place for both approaches, or is there a ‘magic’ within the machines that can’t be captured with a purely laptop-based set-up? It’s not what you use, it’s what you make. The four entities of Aux88 use Pro Tools and Cubase for sequencing, but we all use hardware and software. It helped us take live shows to a new level with what you can do with it, and how many songs we have ready at any time to perform - over 200 and growing. We talk all the time about how technology has come further then we could have ever imagined. The only problem is that some artists or fans don’t really put time in to the music. Just because it’s easy to make music, doesn’t mean you are making good music. I thank all the artists who came before us. Their music is still inspiring, you can listen and hear the beauty of the time, work and love that they put into it. "It’s a beautiful kinship. Some of my machines have been with me so long. I know exactly what each of them can do and they never let me down. They keep showing me things, the more time I give them." The synergy between man and machine is an idea central to the mythology of electro. Do you feel an intimate connection with the technology you use to perform and record – has it become an extension of yourself? Yes! Such a good question, it’s a beautiful kinship. Some of my machines have been with me so long. I know exactly what each of the machines can do and they never let me down, when I spend even more time with them they keep showing me things, the more time I give them. Young people should do one thing: just listen to music and listen even more. You have to really love it and be open to criticise yourself. Finally, could you give us two tunes: one classic track and something new that’s caught your ear?